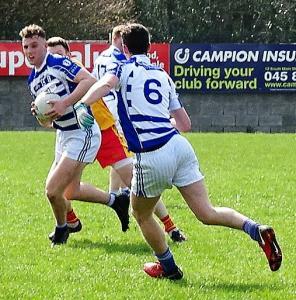 Naas registered their first league win with a dominant performance against the Larries winning by seventeen points at Naas on Sunday.The teams were level at 0 – 2 each after ten minutes but Naas dominated for the reainder of the half scoring nine points to one for Laurences. Naas led 0 – 11 to 0 – 3 at the interval. Naas completely dominated the second half scoring ten points to 1 for the Larries. Eleven Naas players got their name on the scoresheet. The highlight was two converted “45”s by Naas goalkeeper Luke Mullins. Laurences opened the scoring after two mnutes with a Stephen Mann point. John Joyce equalised for Naas. Then Eamonn Callaghan and Podge Fogarty swapped points. The sides were level at o- 2 each. Naas took control for the remainder of the half scoring five points without reply from Davy Shaw, Dean McHolmes, John Joyce and Luke Griffin(2). Podge Fogarty reduced the arrears with a point. However Naas repied with four from a Ciaran Doyle free, Brian Kane, a Luke Mullins “45” and an Eamonn Callaghan free to lead 0 – 11 to 0 – 3 at the interval. The second half continued in the same vein with Naas adding another ten points to one for The Larries. Any attacks set up by the visitors were repelled by a very strong Naas defence..
Scorers: Naas: Eamonn Callaghan(0 – 5) , Luke Griffin(0 – 3), Darragh Kirwan(0 – 2), John Joyce(0 – 2), Luke Mullins(0 – 2), Dean McHolmes(0 – 2), Ciaran Doyle(0 – 2), Davy Shaw(0 – 1), Paul Sullivan(0 – 1), Adam Cronin(0 – 1). St.Laurences: Podge Fogarty(0 – 2), Stephen Mann(0 – 1), Shane Miley(0 – 1). Teams: Naas: Luke Mullins,Fiacra Piggott, Conor McCarthy, Paul Sullivan, Colm Joyce, Eoghan Bateman, John Joyce, Brian Byrne, Brian Kane, Davy Shaww, Dean McHolmes, Brian Stynes, Luke Griffin, Eamonn Callaghan, Darragh Kirwan.